We call our eggs “Beyond Organic.” Our 55hens are not limited to a small outdoor area for only part of the day when weather permits. Instead, they have access all day long, every day of the year, to about 1/2 acre of pasture and bush. This is approximately two hundred times (yes, that is 200!) 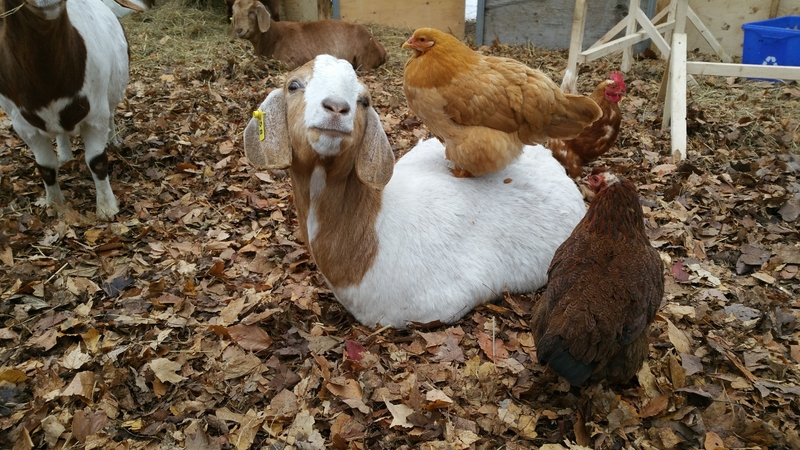 the minimum outdoor space per chicken required for organic certification! 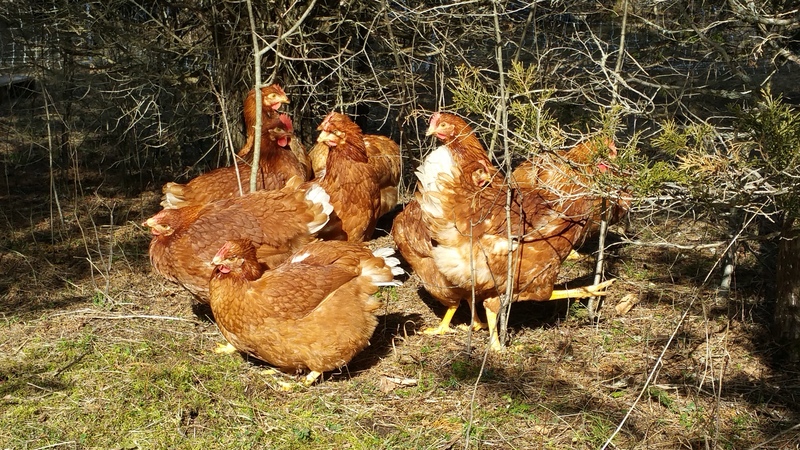 It is a joy to see our hens contentedly scratching the earth, basking in the sun and eating a natural diet of grass, weeds, bugs and worms. People coming for eggs often like to spend time watching the chickens enjoying themselves in their natural setting. During the summer, “our girls” are delighted to receive waste from our vegetable garden, including the zucchinis that grow too large and the tomatoes that got too soft. It is amazing to see how fast they can devour a 10 pound zucchini! At the end of the summer growing season, we expand their paddock to include the vegetable garden and they help us get it ready for the next season by tilling the soil and eating insects, weeds and waste vegetables. The green portion of their diet is increased throughout the growing season by our bringing them loads of cuttings from our large lawn which has been seeded with clover, a delectable, high protein food providing excellent nutrition for the chickens. In addition, we have now acquired an old lawn tractor with a bagger with which we bring large amounts of cut grass from the orchard back in the property. Studies have shown that eggs from pasture raised chickens are much more healthful for people: lower in saturated fat and cholesterol than regular eggs and much higher in Vitamins A. When our “girls” don’t feel like going outside in the winter (but some do venture out, except when the snow is deep), they share about 1,200 square feet of the hoop house with our goats. They contentedly scratch through the bedding of hay, bask in the sun coming through the hoop house plastic cover and steal hay and grain from the goats. They eat enough green leaf from the hay (alfalfa and timothy grass) to continue the health benefits of pasture-raised eggs. The rich deep yellow of the yokes throughout the winter attest to the fact that they are still getting plenty of greens in their diet. We supplement their natural outdoor diet with non GMO layer mash and non GMO corn grown locally by Ben Cowan. Eggs are sold in the “Honey Shack” at the end of our driveway, 573 Morrison Point Rd, but they often sell out early. If you would like to reserve eggs, please call Bob or Sheila at 343-600-4225 or email us at Robert.burkinshaw@gmail.com. Please note that in winter, on days when temperatures are below -10C, we keep the eggs in the house to keep them from freezing. Please come to the house for eggs. Feel free to call us (343-600-4225) to confirm that we are home and have eggs available. The chickens choose to spend most of their days outdoors in the large paddock of grass and bush. Sharing space with the goats in the winter in the hoop house. The outside door is open every day in the winter and some do go outside but often they prefer to stay in their large and bright indoor home where they can scratch through the bedding, bask in the sun and steal grain and hay from the goats. 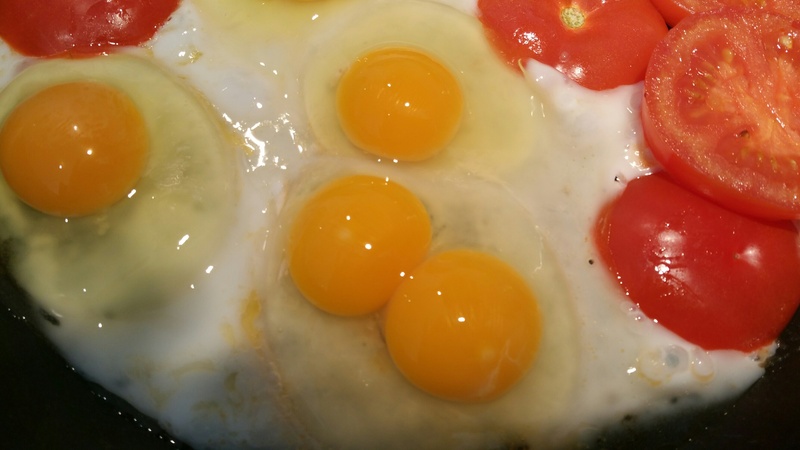 The rich, deep yellow of the egg yolks reflects the chickens’ health and their natural diet. Studies have shown that eggs from pasture raised chickens are much better for people: lower in saturated fat and cholesterol than regular eggs and much higher in Vitamins A.